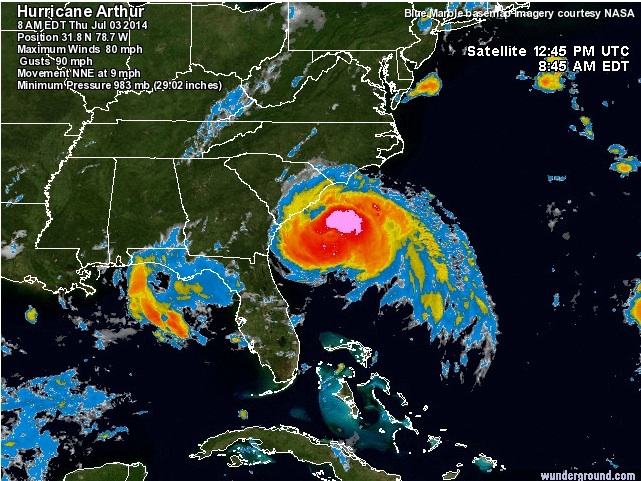 Tropical Storm Arthur, now being classified as Hurricane Arthur, in this image courtesy of Weather Underground. SUSSEX COUNTY, NJ – Sussex County’s County Seat is under a Flash Flood Watch, with chances of thunderstorms this morning, and today. 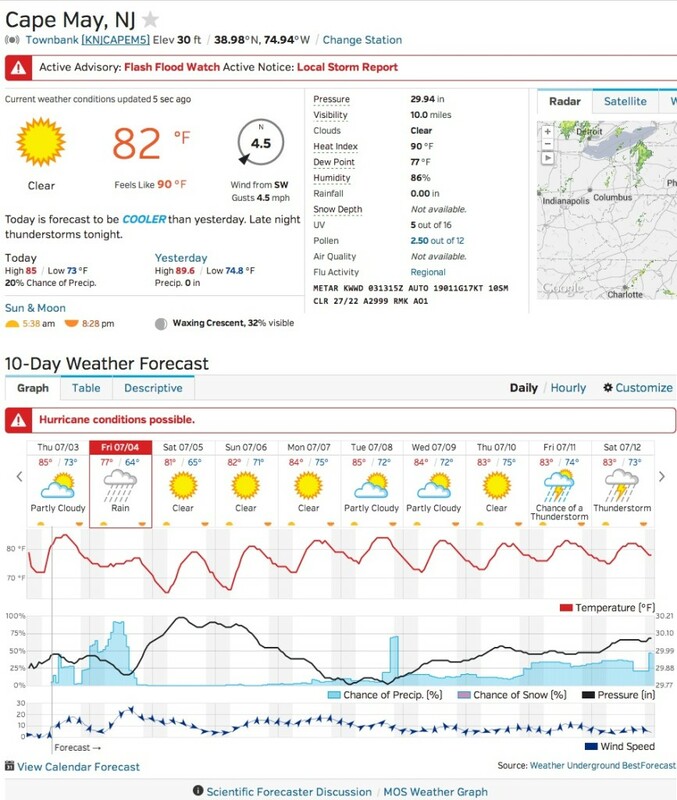 The Town of Newton weather forecast as of July 3, 2014. Image courtesy of Weather Underground. Weather Underground is reporting that the Tropical Storm Arthur that we reported about yesterday has nearly neared hurricane strength as of yesterday, as it makes its way up the Eastern Seaboard. For those in the Jersey Shore area, hurricane conditions on Friday, may be a possibility. A Flash Flood Watch is defined as the possibility of flash flooding due to heavy rainfall. With today’s rainfall, creeks and streams may overflow into the roadways. Weather Underground cautions residents to take action if Flash Flood Warnings, where this condition actually occurs, takes place. This watch extends from Northeast Maryland (Cecil) to Northern Delaware (New Castle), and portions of New Jersey, including the following counties: Burlington (northwest) Camden, Gloucester, Hunterdon, Mercer, Middlesex, Monmouth (western), Morris, Morris, Salem, Somerset, Sussex and Warren. Pennsylvania counties under today’s Flash Flood Watch include: Berks, Bucks (upper and lower), Carbon, Chester (eastern and western), Delaware, Lehigh, Montgomery (eastern and western), Monroe, Northhampton, and Philadelphia. For those in the shore areas, such as Seaside Heights, NJ, temperatures are warmer than yesterday with the possibility of scattered thunderstorms. However, with the possibility of Tropical Storm Arthur’s arrival, hurricane conditions may be possible, per the image taken from the city’s forecast. Seaside Heights is under as Flash Flood Watch as well. Further south in Cape May County, wind damage has already been reported, due to 40 mph gusts. A Flash Flood Watch is in effect as well for that area. Seaside Heights NJ Forecast as of July 3, 2014. 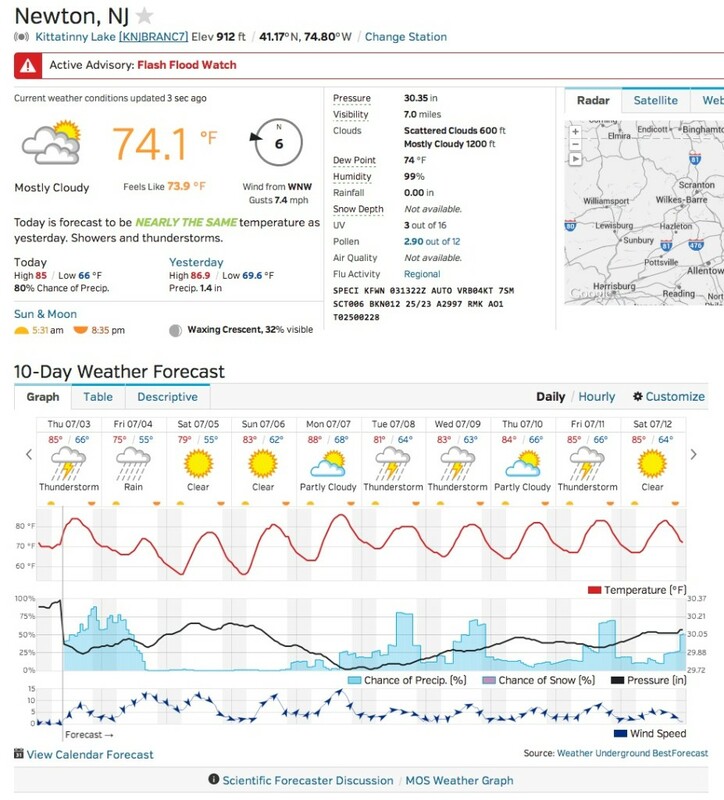 Image courtesy of Weather Underground. Cape May Forecast from July 3, 2014. 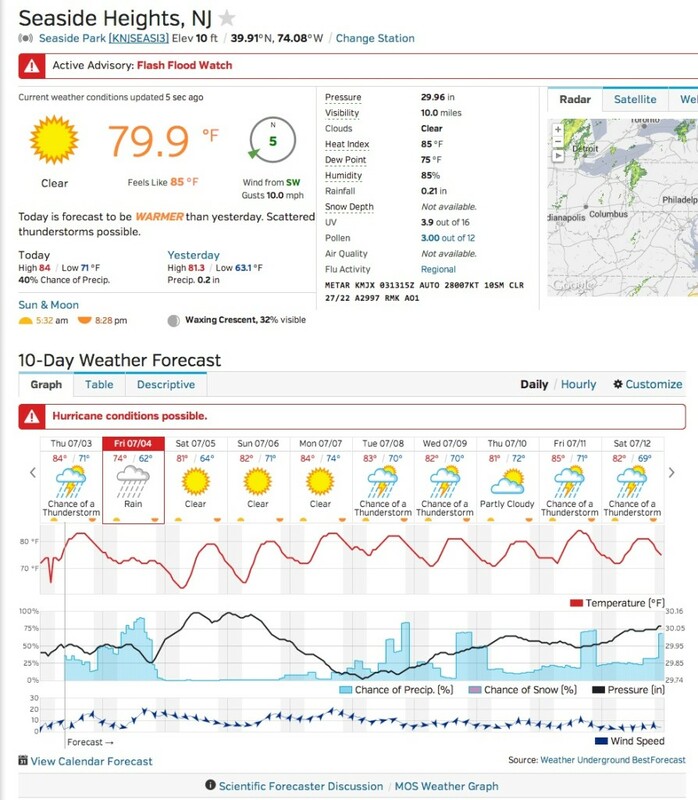 Image courtesy of Weather Underground. In terms of a July 4 forecast in the Sussex County area, Weather Underground is still calling for soggy conditions tomorrow,with rain predicted. Saturday and Sunday are expected to be sunny, with milder temperatures than over the past few days. 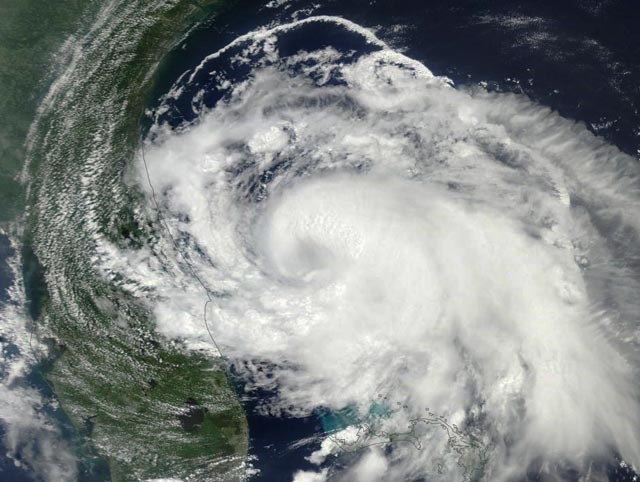 The storm, as pictured below in the satellite image courtesy of Weather Underground, formed a 30-mile diameter eye, according to Dr. Jeff Masters, the meteorology director for the site. As reported yesterday, the storm is expected make its way the hardest, to the Outer Banks on Friday, with winds at about 80 to 95 mph. Most of North Carolina is now under a Hurricane Warning. A satellite view of Arthur off the Southern Atlantic Coast, late on Wednesday night, courtesy of Weather Underground. NJInsideScene.com will continue to keep readers informed of this storm track, as well as the possible rescheduling of events for the holiday celebrations, due to inclement weather. Click here to stay on the inside scene and follow us on Facebook.